A night of double feature action of the Thursday Thunder Legends Series Presented by Papa John's Pizza saw the return of a Thursday Thunder alum turn NASCAR star - Garrett Smithley. Garrett Smithley ran in the Thursday Thunder program from 2008 through 2011 with a few races ran in 2012. Smithley returned to his home track of Atlanta Motor Speedway to participate in the racing program that made him a regular competitor in the NASCAR Xfinity Series. "Thursday Thunder has always been really special, explained Smithley. "I started racing Legends and Bandolero cars when I was 15. I raced my first season in 2008 and won championships and races. It's where I got my start so to come back mean a lot to me." Smithley competed in both features of the VP Racing Fuels Pro Division where he battled against the best on the tough quarter mile "Thunder Ring". At the start of the first feature, Christopher Clanton from Brooks took the lead from Canton's Dawson Fletcher. However, Fletcher would not go down without a fight. The two battled back and forth for the lead throughout the first two laps, but Clanton prevailed, leading the rest of the feature and winning his first VP Racing Fuels Pro race of the season. Stockbridge's Jensen Jorgensen took the lead at the drop of the green flag of the second feature. However on the sixth lap, Christopher Clanton took the lead and never looked back. Clanton would go on to win his second VP Racing Fuels feature of the season and the night. Garrett Smithley finished the first feature in the eighth position, and seventh in the second feature. 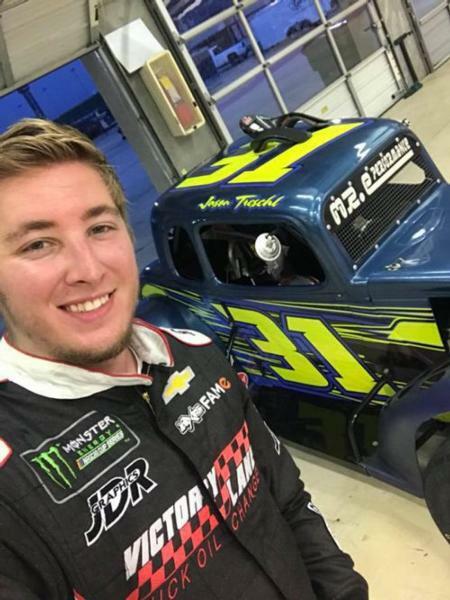 Smithley explained how he will continue to promote the Thursday Thunder program as he continues his rise in the NASCAR elite series, "For me, this is where I started and this is where I want to give back to. When people ask me "Hey, where do I need to go and what do I need to do to be a racecar driver?" I tell them to go buy a Legends or Bandolero car and to run in this Legends series." The first feature of the Semi-Pro Division began with Davis Rochester from Lebanon, TN taking the lead, but a mistake from multiple drivers led to a complete restart. Upon the restart, Griffin's Cale Hall took the lead from Rochester. Hall continued to lead throughout the rest of the feature to win his first Semi-Pro Division feature win of the 2018 season. In the second Semi-Pro feature, Davis Rochester once again took the lead but as quickly as he had it, Atlanta's Drew Dollar took it away from him. However, Cale Hall once again took the lead and ran with it. Hall won the second the Semi-Pro feature of the night making it his second feature win of the season. In the first Masters Division feature, Locust Grove's Bill Plemons Jr. led from the start. With McDonough's Robbie Woodall looming behind him, Plemons continued his lead. On the sixth lap of the feature, Woodall made his move, stealing the lead out from under Plemons. Woodall maintained his lead, outrunning Plemons all the way to the finish. First feature winner, Robbie Woodall took the lead at the beginning of the second Masters Division feature, but immediately lost it to Bill Plemons Jr. Plemons led until lap nine, where Woodall regained his precious lead. Woodall led for the remainder of the race, once again outrunning his season-long rival, Bill Plemons Jr. The first feature of the night for the Associates Group Young Lions Division, Ryan Rackley out of Valdosta led the way at the drop of the green flag. Lawson Ingold from Social Circle battled Rackley for the lead over the next few laps. Rackley lost the lead to Ingold on lap five. Ingold led the field for five more laps until Blaze Crawford out of Fayetteville tapped and passed Ingold on lap 13. Crawford was poised to win the feature until he got loose in turn four coming to the checkered flag. Lawson Ingold took the lead and the checkered flag. In the second feature, Pictou, Nova Scotia's Austin MacDonald took the lead at the start with Ryan Rackley hovering behind him. On lap five, Rackley made his move passing MacDonald for the lead. However, a lap later, Blaze Maddox made his move, passing Rackley. Maddox led from that point forward, winning the feature. The only feature of the Chargers Division featured reality television star Josh Owen, from the hit show "Moonshiners". Zac Bacon from Buchanan took the lead on the initial start and led for the first 11 laps. However, the celebrity from Columbus, NC, took the lead on the eleventh lap and drove to his very first Thursday Thunder victory. Unfortunately due to weather, the Bandolero division races were postponed to another week. The series will resume with Week 9 next Thursday, July 26, with the Championship Finale hosted on a special Saturday edition on August 4.